October 10th is World Mental Health Awareness Day! More than 450 million people worldwide suffer from mild to serious mental health issues such as post-traumatic stress, depression, anxiety, bipolar disorder, self–esteem and financial stress – all of which disproportionately affect women around the world. Recognizing that mental health issues are one of the greatest challenges women face, Philosophy created the hope & grace initiative which pledges an unending commitment to support mental health and well being. Previously celebrity ambassadors such as Ellen Pompeo and Zelda Williams have endorsed the program. Begin each day positively. Happiness is your choice, so if you wake up feeling grumpy, remember that you can choose to be happy. Think of yourself as a lighthouse: It’s OK to feel your feelings, good or bad (in fact, it’s much better than disassociating from them), but use the lighthouse idea to rise above the trauma in your life and allow it to flow freely around you. Move. The human body needs to move, and movement is imperative for the lymphatic system to work properly and to oxygenate your cells. Bounce, jump, dance, or do whatever it takes to move the tension out of your body and get your blood flowing. Recently, Philosophy and the hope & grace initiative for women’s mental health hosted a discussion focused on re framing well being as a key to resilience and change alongside Monica Seles, 9-time Grand Slam singles tennis champion; former World No. 1; Wellness expert Stephanie Covington, PhD., Co-Director of the Center for Gender & Justice; Kavita Beri, MD, Fellow, Regenerative Cosmetics at TRI Princeton; and Marie-Pierre Stark-Flora, Global SVP, philosophy at Coty, Inc. spoke at the Women’s Forum for the Economy and Society in Paris, France. It is here the panel discussed ways to amplify the conversation around women’s mental health. Where there’s hope, there’s grace. The hope & grace initiative represents an unprecedented and unending commitment by Philosophy to support mental health and well-being. Mental health issues are one of the greatest challenges women face. More than 450 million people worldwide suffer from mild to serious mental health issues – such as post-traumatic stress, depression, anxiety, bipolar disorder, self–esteem and financial stress – all of which disproportionately affect women around the world. 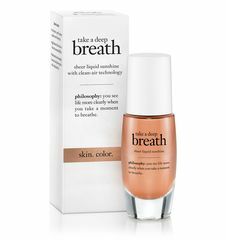 With the initiative, philosophy becomes the first company to place a deep focus on this important cause and the first major beauty company to make a brand-wide commitment to dedicate 1% of its sales toward the cause. 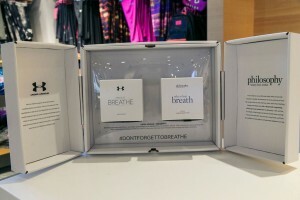 For every product sold (this includes all products, no limitations), Philosophy will contribute 1% of sales to the hope and grace fund, and will award multiple financial grants each year to local organizations working to empower women through promotion of mental health and well being, and the prevention and treatment of related issues. The majority of funding from the hope and grace initiative will support community-based programs doing the most good in mental health and well being. The funds will be distributed by an independent nonprofit organization with guidance from the world’s leading practitioners and experts in mental health and well being. With an average grant size of us $25,000-$75,000, the fund will support hundreds of organizations each year and touch thousands of lives. The priority focus for the hope & grace fund is to support community based mental health efforts working to overcome barriers to and stigma around seeking treatment for mental health issues, providing access to mental health treatment, and fostering support networks for women with mental illness. Tuxedo Jacket by H&M, $50 – I am absolutely obsessed with this jacket! It’s super versatile so you can dress it up or wear it more casual. What I love about H&M is that they offer quality and on trend pieces without breaking the pocket so this is sure to be a gift that will get a lot of years of use. Rebecca Minkoff Glitter Clutch, $95 – A statement clutch is always a great idea. This Rebecca Minkoff envelope clutch is a showstopper! Stuart Weitzman Boot, $419 (Org. $698) – While on the pricier side, these Gold boots are everything. They will turn an ordinary outfit to a standout one instantly. Don’t think you’re ready for such a bold color? No problem – these also come in Black, Brown + Blue and are all on sale! Ralph Lauren Romance Trilogy, $65 – The Romance Collection by Ralph Lauren offers a fragrance for every woman. With this exclusive set, you can enjoy all three scents, Romance, Midnight Romance, and Tender Romance. They are smell delicious! Martini Twist from Thoughtfully.com, $30 – Thoughtfully.com is a website I just recently found out about and I’m hooked. They offer amazing gift sets for every occasion and for everyone on your Holiday list this year. This set is perfect for the Martini lover in your life. Appletini? Singapore Sling? YES, please! Just add your favorite libation and let loose. 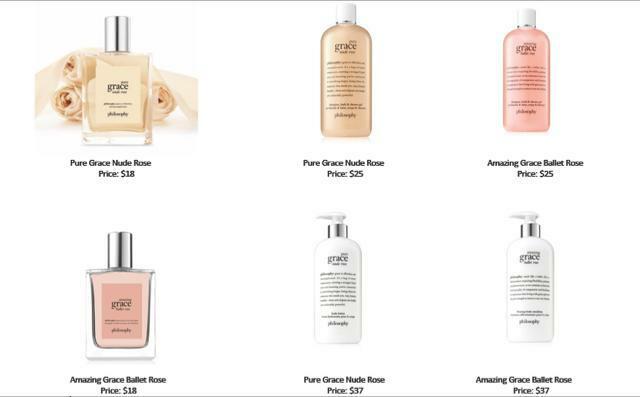 Philosophy Pure Grace Set, $57 – The ultimate holiday gift: Pure Grace. This limited-edition collection offers an uplifting sensorial experience featuring the fresh, crisp, infinitely clean scent of pure grace 3 ways, perfect for layering or enjoying individually. Steve Madden Pom Pom Hat, $16 – I think knit hats in general always make good gifts. I love this one because it’s super warm. The pom pom detail is very in and super cute! Festive Bouquet from FTD, $160 – Aren’t us women just suckers for a gorgeous bouquet of flowers? This Luxury Bouquet includes: red roses, red spray roses, red tulips, green hydrangea, red hypericum berries, lush greens, and a modern gold keepsake vase. 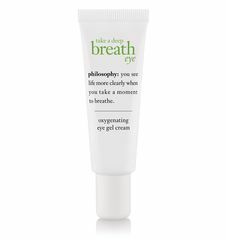 This fall, Philosophy, the wellbeing beauty brand, is collaborating with Golden Globe nominee and 2015 People’s Choice Awards winner Ellen Pompeo on a campaign to eliminate stereotypical perceptions of middle age and introduce a much cooler option based on the facts. To celebrate the release of Uplifting Miracle Worker, Philosophy and Ms. Pompeo will promote a new reality—that middle age can be the coolest time of your life—inviting women to remove the anti in anti-aging and replace it with cool. Women everywhere are invited to join the conversation and declare themselves or women they admire #CoolAgers through original interactive content and social media activity. Did you hear? The mid-life crisis is over! A recently released 25-year longitudinal study conducted by the University of Alberta has demonstrated that the phenomenon known as the “mid-life crisis” is unfounded and therefore untrue. Their study shows that happiness actually improves consistently over time. To celebrate this sentiment, Philosophy will launch original video content featuring Ms. Pompeo in comedic, stereotypical roles that have historically defined middle age. Giving the message greater depth will be the host site of the video—CoolAger.com—an online destination for women defined not by chronological age, but rather a will to live life by their own guidelines. The website will feature contributions by renowned authors to serve women young and old who want to envision their lives as uplifting, enlightened experiences instead of a series of planned events. As with every launch, Uplifting Miracle Worker will inspire both beautiful skin and beautiful days, with contributions toward women’s mental health causes. In July 2014, Philosophy launched the Hope and Grace Initiative, the cornerstone of the brand’s philanthropic mission wherein 1% of Philosophy product sales across all retailers supports community-based organizations working to empower women through the promotion of mental health and wellbeing, and the prevention and treatment of related issues. Unique to Uplifting Miracle Worker, Philosophy will donate $10,000 to the Aviva Family and Children’s Services, a Los Angeles-based nonprofit organization dedicated to providing community mental health services and support to at-risk children and families, and personally chosen by Ms. Pompeo. To date, Philosophy has granted $1.8 million to 29 mental health organizations across the country. 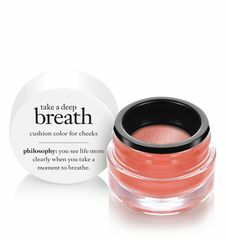 Philosophy has launched their newest product line – Take A Deep Breath Collection. This collection creates an oxygen reservoir on the skin, allowing the oxygen to help absorb the key essentials in the product being applied. 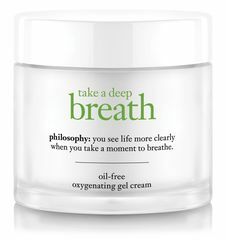 Philosophy’s new oxygen line leaves the skin to breathe freely, combatting signs of aging from a busy lifestyle. 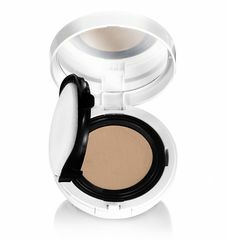 With barley leaf extract there is also a patented 8 aox blend which protects from 99% free radicals. 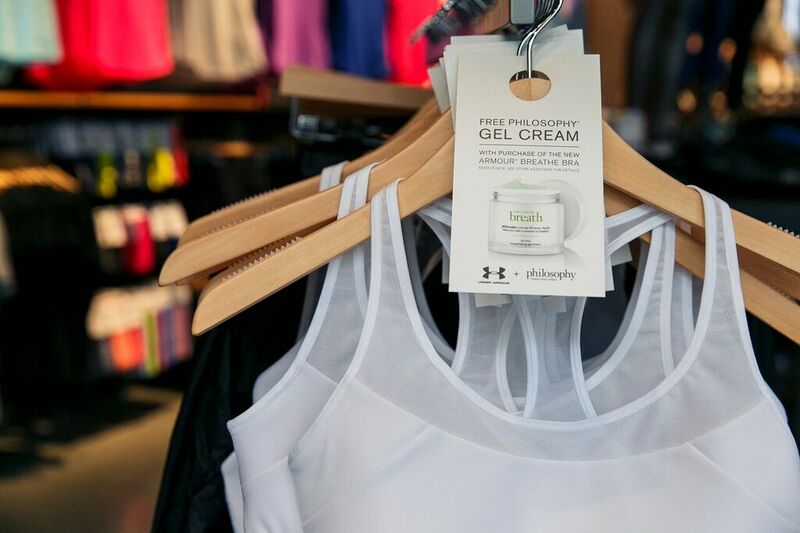 Philosophy has also teamed up with Under Armour! To mark the launch of Philosophy’s Take a Deep Breath oxygenating gel cream and the Under Armour Breathe Bra, the two wellbeing brands join forces to inspire a movement reminding women that breathing can change everything, so #dontforgettobreathe.